Perhaps you remember back in May, when we had written about how we were desperately searching for dresses to wear to our good friend, Mike's, wedding. Well, Mike and his new bride, Sheryl, are so important to us that we've decided to feature them in a multi-post "Real Couple" series! Sheryl and Mike met back in April of 2004 at NJIT, in Newark, New Jersey, and have been together ever since. Introduced by a mutual friend (who would later become the charming best man), they began chatting online, dining at the campus cafeteria, and watching the latest episode of The O.C. (oh how we miss it...). Their relationship continued to grow, they began dating officially, and eventually Mike and Sheryl graduated college and moved in together. Then one day Mike, being ever so sneaky, created a romantic candle lit path in a park in Sheryl's hometown and lured Sheryl there saying they were having ice cream. Sheryl never did get that ice cream... but, she did get a ring! This particular ring meant a lot to Sheryl, and she wrote to us with the story behind the ring that was so sentimental and sweet that we had to share it with you as well. Sheryl writes, "Mike proposed using my grandmothers diamond set on a setting I had pointed out a few months before. She had been sick for awhile and had given it to my mom for me or my sister to use. The day after he proposed we went to visit her to tell her the good news, and she passed away the next day." 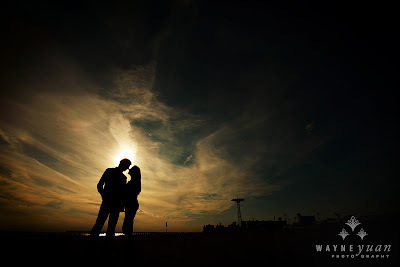 So, with Grandma's blessing, they began their wedding planning and decided they wanted to work with Wayne Yuan, of Wayne Yuan Photography, for their engagement and wedding photography. We asked Sheryl why they picked Coney Island and she said they loved the colors and industrial feel. She went on to add, "there is something about that place that makes it eerie and amusing all at the same time, and there is so much to offer in such a small area that allows for a lot of great photo opportunities." Coney Island was an exciting, entertaining, and bustling spot during the early 19th century and to this day its allure is still apparent. 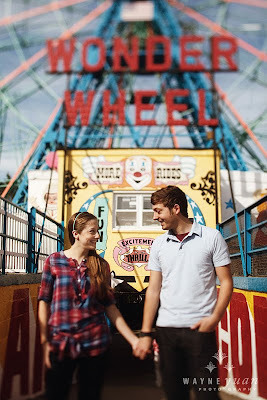 Maybe it's the smell of cotton candy and funnel cakes, maybe it's the history and romance wondering how many couples had courted there before them, or maybe it's just genuine love for one another, but whatever it is, these photos really capture Mike and Sheryl's joy in being together. We think Wayne did a brilliant job capturing the moment, and we love the bright colors, sweet poses, dramatic lighting, and composition. Take a look for yourself! Thanks, Mike and Sheryl for sharing your engagement with us! And thanks to Wayne Yuan for the beautiful eye candy! Check back next Friday for Mike and Sheryl's Wedding!